Between deforestation, climate change, and poaching, the number of orangutans living in the wild is dropping at an alarming rate, but one orangutan in particular has made it through all this torment and her story is giving us all hope. Her name is Alba, and she is truly one of a kind. 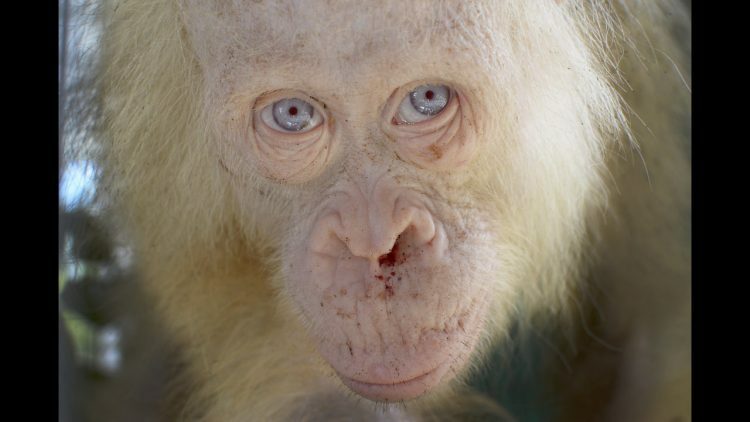 Alba is an albino – currently the only known one in the world. 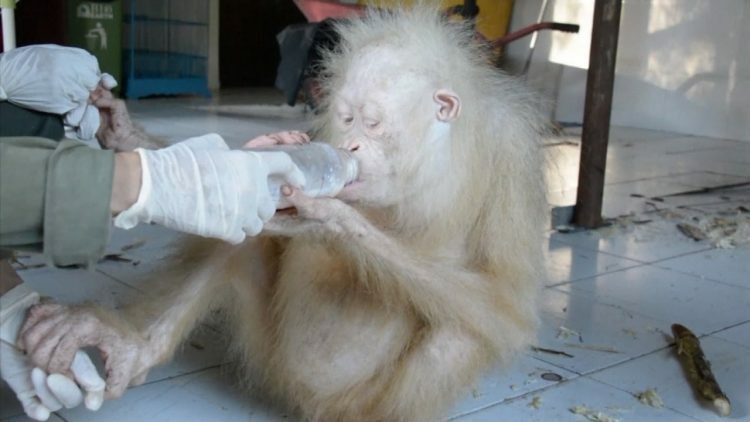 The five year old ape was rescued in an Indonesian Village by the Borneo Orangutan Survival Foundation (BOS). She had been illegally captured and kept in a cage without proper care for a couple of days before rescuers got to her. Researches believe Alba was orphaned at a young age and caught not long after. When they found her she was suffering from a parasitic infection, dehydration, and low body weight. However, she still displays wild behaviors, meaning she can be released in the wild. Orangutans, which are typically reddish-brown in coloring, are very docile creatures with even temperaments and are usually friendly towards humans. Save Alba, who was quite wary of people by the time rescuers saved her from her captors. According to Treehugger.com, Alba’s “condition offers additional threats: Health issues like poor eyesight and hearing, and increased potential for skin cancer would make her survival a challenge.” That’s why the dedicated individuals at the BOS are working to create a special reserve for Alba that will include amenities suited to her unique needs. “To ensure that Alba can live a free and fulfilling life we are making her a forest island home, where she can live freely in natural habitat, but protected from threats posed by humans,” the orangutan rescue foundation said in a statement. The reserve will be “a moat-encircled 12 acre-haven near its orangutan rehabilitation center in central Kalimantan on Borneo.” In a statement made to ABC News, spokesman Nico Hermanu said that “the foundation is starting a public appeal to raise $80,000 needed to buy land.” Alba will be sharing the reserve with three other orangutans that she has bonded with during her time in the rehabilitation center. While the fight to save these beautiful creatures is still far from over, Alba’s rescue marks an important milestone for conservationists and offers a unique opportunity to study this incredibly rare ape in a habitat close to natural. 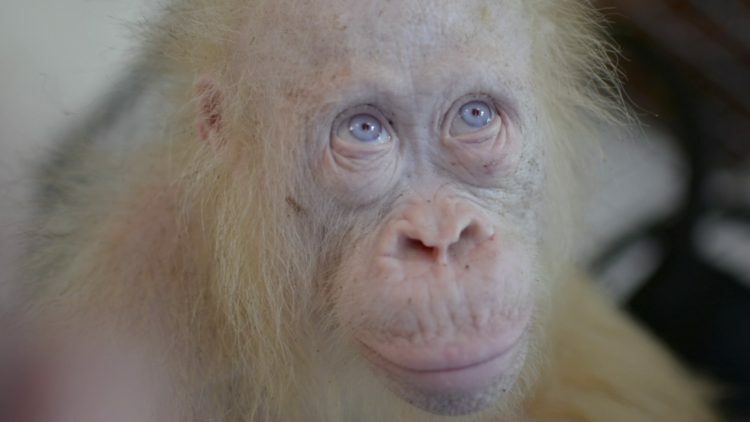 To learn more about Alba, the world’s only albino orangutan, and how you can help build her a safe and happy home, visit the Borneo Orangutan Survival Foundation. She is just one orangutan, but she can raise awareness to the plight of her critically endangered species.